RVs: A Great Way To Travel With Pets | Will My Dog Hate Me? 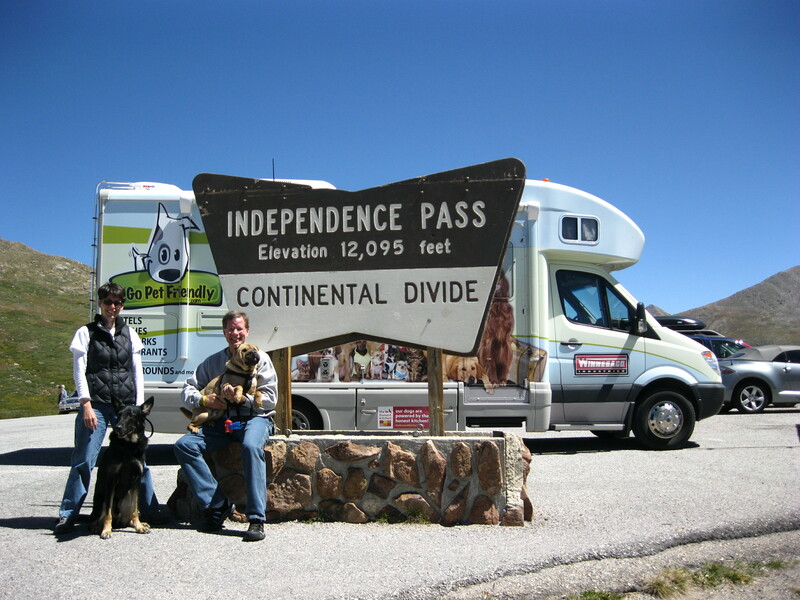 Today, for my continuing Pet Travel Thursday series, I’m turning my blog over to Rod Burkert, 1/4 of the Go Pet Friendly team. Sure, Rod and Amy are the drivers and the food providers, but Ty and Buster are the inspiration for their venture — and they’re very photogenic — so I’m giving them equal billing. How the hell did we end up in an RV? And a dog friendly one at that? Edie asked me those questions* a few weeks ago when I wrote a tongue-in-cheek post on Pet Travel Tails about amusing RV names that we’ve encountered on our travels. When Amy came up with the idea of GoPetFriendly I remember saying: You can’t tell people how easy it is to travel with their pets if you’re sitting behind a computer in an office somewhere … you have to do it. As it turned out, those words set us on a course that has dramatically changed our lives. For the better. So BTRV (Before The RV), we put several thousand GoPetFriendly miles on our 2004 Toyota Rav 4. We removed the back seats, creating a sprawling den of inequity for Ty and Buster and all their accouterments. Our stuff? It got crammed into a smallish, hard-to-get-into, rooftop luggage carrier. GoPetFriendly would have been a short-lived venture if the Rav 4 would have remained our mode of transportation. Cramped quarters, dog farts in said cramped quarters, and regularly schlepping belongings in and out of hotels were killing my enthusiasm. Yet, was I ready for the RV experience? In retrospect, the idea of traveling in an RV gathered slowly … like dark clouds that foreshadow an approaching maelstrom. First, Amy and I just started noticing RVs on the road. Next thing I know, we’re at one of the largest RV shows in the country in Hershey, PA. I think we toured every vehicle on the lot – looking at a combination of price, size, and pet friendly features – and took scrupulous notes. Nope. Amy and I (mostly Amy) just jumped right in with both feet and got ourselves a brand spanking new 2010 Winnebago View. I believe this level of devil-may-care attitude is a shared and serious character flaw. Lucky for us, it has worked out really well. Our RV is a svelte 24 footer, although we grew 2 feet this year when we added a much-need rear-mounted storage compartment. I believe the largest RVs – those resembling a tour bus – can stretch out to a neck-craning 45 feet. This may be an option when GoPetFriendly can afford a driver because you won’t see me handling anything that big anytime soon. Kinda related to size. We did not want to tow a car (a “toad vehicle,” as it’s referred to in RV circles). Our RV is built on a Dodge Sprinter chassis, making it very light on its wheels. We always feel we can go anywhere a UPS truck goes, and we’ve negotiated some pretty narrow city streets. Hey, I’ve even parallel parked this baby a couple of times. The engine is a Mercedes Benz diesel. I’ve never been mechanically inclined and don’t much understand the difference between diesel and gas engines – I just heard that diesel was the way to go. We get about 14-16 miles per gallon – a Dogsend for an RV and a source of relief now that diesel gas has hit $4 a gallon. We get our best mileage driving east (harnessing the tailwinds) and south (going downhill). We’ve got heat and air conditioning. There’s a pull-out sofa, dining table with bench seating, flat screen TV, and “full” bath. The galley area has a refrigerator, 3-burner gas stove, and convection oven. We purposely selected the bed over the cab model (meaning we climb up and down a 4-step ladder). My nose is about 10 inches from the ceiling, but it’s like the bunk bed I never had as a kid. And this option gives all four of us more floor space in the coach area. Believe it our not, RVs don’t explicitly offer or tout pet friendly features. Contrast that with the pet friendly model offered via the Honda Element. So in our RV, we looked for a linoleum floor and pleather seat fabric to make the daily dog hair removal less of a hassle. The sofa has seat belts, which allows us to tether Ty and Buster’s harnesses to secure anchor points. We have a skylight in the front of the coach and an exhaust fan in the rear. This permits cooling air to circulate inside the RV when we occasionally have to leave Ty and Buster behind. There is also an outdoor shower that we use to wash off dirty paws. With the options we selected, the RV listed for about $110,000. We approached Winnebago (actually visiting with representatives at the plant in Forest City, IA) about a marketing relationship. In exchange for advertising on the RV, Winnebago gave us a price discount that we couldn’t refuse. We are under no further obligation to Winnebago, though we would be happy to do almost anything for them because we like our RV that much. We did visit the plant again last September to give Winnebago an update on our travels and bark about some ideas that would make RVs even more pet friendlier to travel in. Stay tuned. Mine, that is! I was 53 when we acquired the RV – well below the minimum required accumulated life experience that one usually associates with RV owners. So, Are RVs A Great Way For Everyone To Travel With Pets? You’re not limited to your car’s trunk space. If more gear (yours or your pets’) will make the trip more enjoyable, an RV has room to stow it away. You have the option of cooking your own (healthier) meals. And by extension, you can save a lot of money if you just prepare your own breakfasts and lunches. You can sleep in your own bed. If you get bugs, you only have yourself to blame! If you need to run out, and assuming the campground allows it, your dog may be more comfortable left alone in the familiar RV than in a strange hotel room. RV parks accept more dogs and larger dogs than do most hotels. You are more likely to run into a breed restriction at a campground than at a hotel. Sound like a slam dunk? If you already own an RV, it is. We can certainly relate anecdotal evidence that most people who vacation in an RV are also bringing their pets. Clearly, there must be a symbiotic relationship! But what if you don’t own an RV? Then the decision may not be so easy. In the interest of full disclosure, here are some tidbits to consider. RVs are not inexpensive. Unless you travel often and extensively, you are unlikely to get back the cost of the RV from food and hotel savings. Gas prices are rising. We have a comfortable driving range of 300 miles, and it can cost $70 to $80 to fill up our tank every day that we’re on the road. If you need to travel in your gas-sipping Prius for economic reasons, an RV is not for you. It helps to be mechanically inclined. With an RV, your car is your house and your house is car car. If something goes wrong with either one (say, a roof leak or an oil leak), you could be sidelined for a few days until the repair is made. The good news: You can rent. Companies like Cruise America, Camping World, and Go RVing will rent you an RV on a daily, weekly, or monthly basis. We see a lot of these rental RVs in our travels. However, there is an additional fee if you’re packing your pets. Certainly, our RV journeys with Ty and Buster have been 95% unadulterated fun. We find the whole arrangement to be pretty cozy. We’re nimble and self-contained. There’s a whole country out there to explore, and we’re blessed to be doing it in an RV with our dogs. Rod and Amy Burkert of GoPetFriendly.com are changing the face of pet travel by making it easy to locate pet-friendly hotels, campgrounds, restaurants, beaches, wineries, dog parks, and much more! Make plans to include your pet on your next trip, and connect with GoPetFriendly on their blog, Twitter, and Facebook to get tips from the pet travel experts. We don’t travel as much as you guys, but we are on the look-out for some more and dog-safer transport space. Maybe renting is an option for us. We have no RV-friends either except you 🙂 At the moment we are in phase 1 of changing to an RV, which as you wrote is “starting to notice RV’s on the road”. RV’s are getting more and more popular in Europe. 10 years ago you could only see them in American movies. But now they are all around us, the smaller models that is. And, if you ever have any questions we can help answer, just let us know. I loved this post. I’ve always had this notion I wanted a an RV, but have never travelled in one. I think it goes back to having the bed over cab Fisher Price model as a kid (a much cheaper option than the real thing). Now we have Snoopy I keep wondering how much more convenient it would be to have an RV. I suspect though, it would make a lot more sense to rent, at least to start with, given the price point you mentioned. Remember too that used RVs are a lot more affordable than buying a brand new one. We seriously considered a used model, but decided against it based on the number of miles that we knew we’d be putting on it. If you’ve had the desire, I highly suggest you try it. When I first mentioned getting an RV to Rod his response to me was “I do not want to live like that!” As you can see, he now loves it. You’re a giant step closer to being happy in an RV than Rod was, so you’ll probably find it delightful! We purchased our RV with about the same amount of thought and research (oh and in our early 40’s). We would never go back. Whether for long trips or just long weekends, we love the freedom and flexibility. The dogs think it is the coolest thing and love hanging out in the campsite with us. 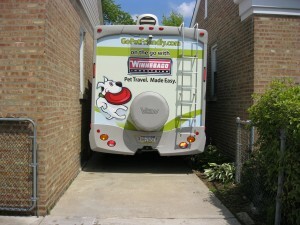 We did go a little bigger (31 feet – but then we have a FEW more paws inside our RV). Yes you do! And your dogs are quite a bit bigger than ours too! So, are dog farts truly less offensive in an RV than a RAV 4? Inquiring minds want [and have got] to know! Great post guys, as always. One of your hugest fans. Ha! We take a lot of road trips and currently pack everything in our Toyota 4 Runner….so great minds think alike. Or at least started out alike. We did get better gas mileage in the RAV4, but the View is pretty good on gas for a motor home. The 14-16 miles per gallon we get is better than my sister gets with her SUV! I never really considered an RV before, because I always thought they would be too bulky and difficult to handle. But whoa, I love this model…nice size and great interior. It looks like you have everything you need. I especially like the ergonomics of the interior layout. Hmm. Something to think about for a possible rental. Great post, Rod. What a great post! I always wondered how you got your RV and how you went about choosing one. Funny enough, I just assumed you guys did a lot of research on what was the best one to buy for both you and the dogs. I actually remember the Rav 4. If I remember correctly, Ty (or was it Buster?) was sick on one of your trips when you still had the Rav 4. I remember being worried and hoping he would get better. the RV is much better for all the travel you do. Re: dog farts – the Element isn’t much better when it comes to that. I find it amazing that RV manufacturer’s don’t emphasize their pet-friendliness. I do a bit of tent camping and it looks like nearly every RV has a dog or two (or more). I always assumed that RVs mostly existed for people who want to travel with their dogs. I’d add one more benefit of RVs–by living in one full time, you’ve reduced your environmental impact. I know that seems counterintuitive to some but most people have no idea how much energy a conventional house uses. Also, your mode of travel prevents you from accumulating lots of stuff, another big environmental benefit. I’m in the early stages of moving toward life on a sailboat. More and more, I see RVers as my partners in an effort to minimize my lifestyle. 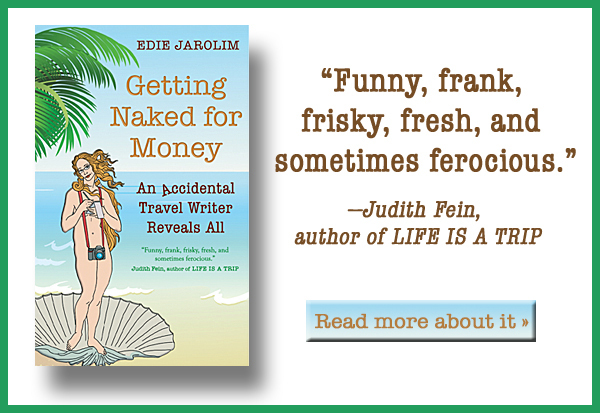 I love reading about your travels–it keeps me inspired while I’m doing my long, slow research. Life on a sailboat with a dog — your life (not to mention your blog) will definitely take an interesting direction! It baffles me as well, Pamela! I read somewhere that 70% of RVers travel with a pet. It seems to me that if the manufacturers would make a “pet friendly” package with a few features Rod and I have concluded would be truly useful, people would be happy to pay a little extra for those conveniences. I love this minimalist lifestyle. I didn’t realize until we started traveling how much all of our “stuff” weighed us down. Getting rid of most of our possessions was a big job – and the money we got from selling our things made me sick when I thought of how much we’d spent – but now that the “cleaning out” is over, I’m so much happier. Hmm. I was never attracted to RV travel. But, you just might have planted a seed. Nice post. I’m told that many (all?) hotels/motels won’t let you leave the dog there if you go out, say to go out to dinner. So this sounds like another reason traveling in an RV would be a bonus, to be able to occasionally leave the dogs in a safe and comfortable, familiar place. We’ve been living in an RV with our energetic border collie for the past year, and it certainly does present some unique challenges. A little while ago we put together an article with some in-depth tips on RV Travel with Pets that some folks might find useful as well. Cheers! Thanks for coming by and thanks for the link to your RV article; very useful. Your post says “the sofa has seat belts, which allows us to tether Ty and Buster’s harnesses to secure anchor points.” I’m not sure what tethering really means. Do your kids have some latitude to move around or look out the window, for example. In the event of a sudden deceleration or an abrupt swerve will they end up suspended midair? This is a huge concern for me and it’s actually preventing an RV purchase until a satisfactory resolution is found. Thanks for asking these important questions. I will check with the folks who wrote this guest post and let you know. Were retired we want to RV with our seven paws. Riley only has three legs. They are Yorkies. When you are traveling how do you see a city let’s say where do you park your RV so you can go to a museum like Chicago? Thanks for writing! 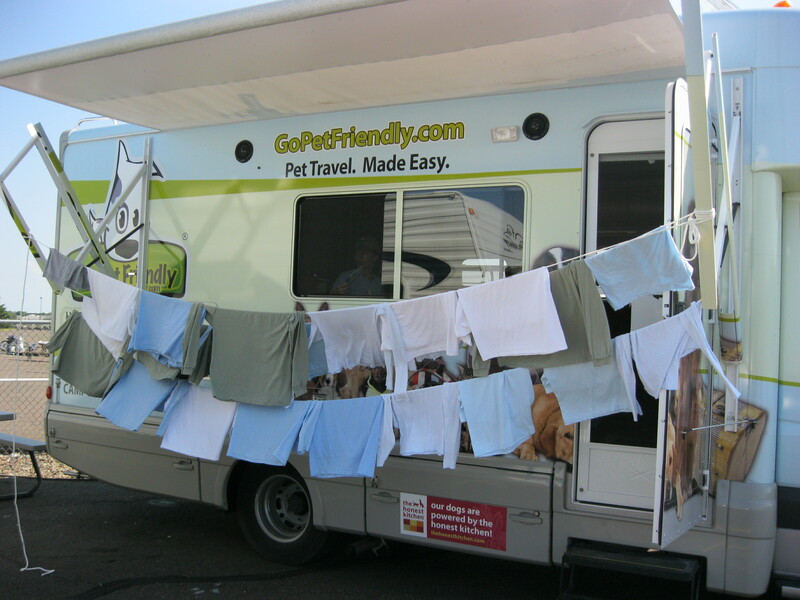 It’s my good pals at http://www.GoPetfriendly.com who are traveling in an RV with their dogs. Do go over to their site and ask them (they’re people friend too). I love Yorkies!